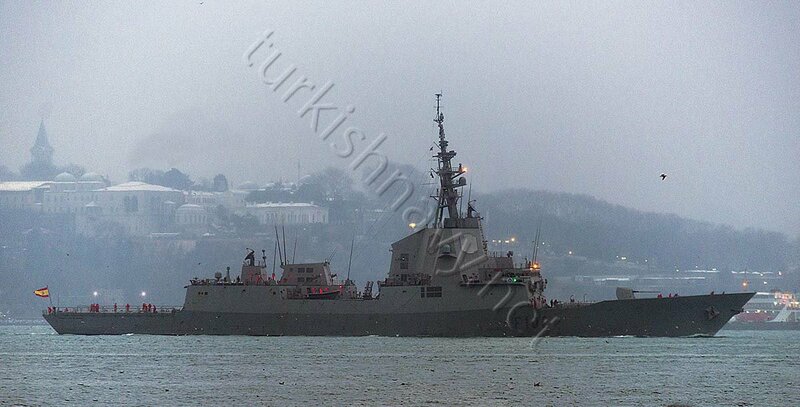 The Spanish frigate F-102 ESPS Almirante Juan De Borbon arrived this morning in Istanbul. It was a cold, chilly morning with little sun and with much snow fall. The frigate is doing a port visit here. She will stay in Istanbul, presumably until Monday and will later pass through Bosphorus and enter Black Sea. Her next port of call has not been disclosed but it will be either Varna or Constanta or maybe both. It was in 2014, when ESPS Almirante Juan De Borbon was in Istanbul the last time.